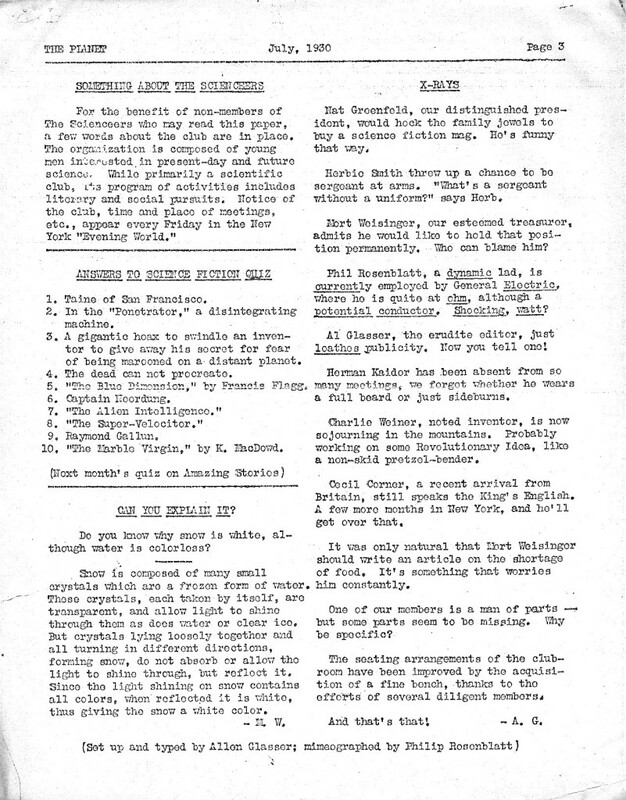 The delightfully inconclusive debate here on the topic of whether the Scienceers or the Eastbay Science Correspondence Club was the first sf club led to a discovery I am happy to share with you. 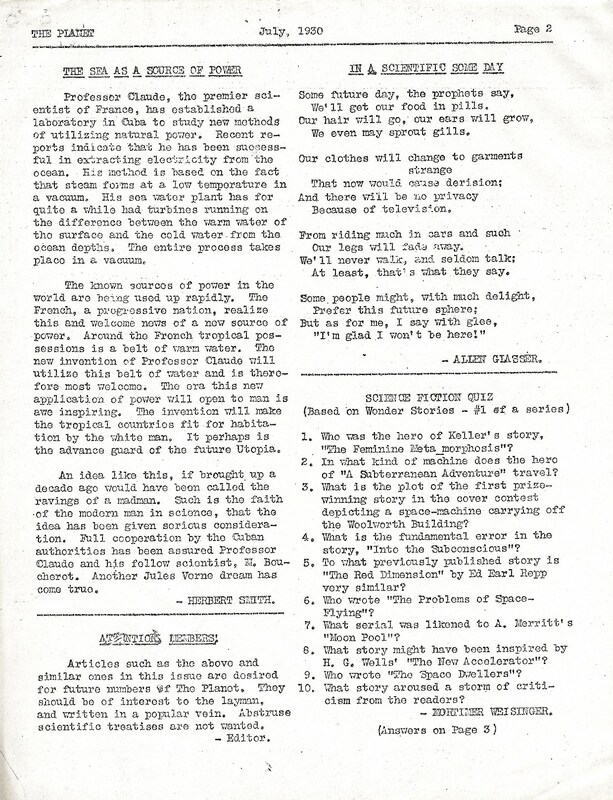 From Guy H. Lillian’s The Zine Dump I learned Ned Brooks had scanned a photocopy of first issue of The Planet, published by the Scienceers in July 1930. Ned kindly sent the images to me and I have uploaded them here. 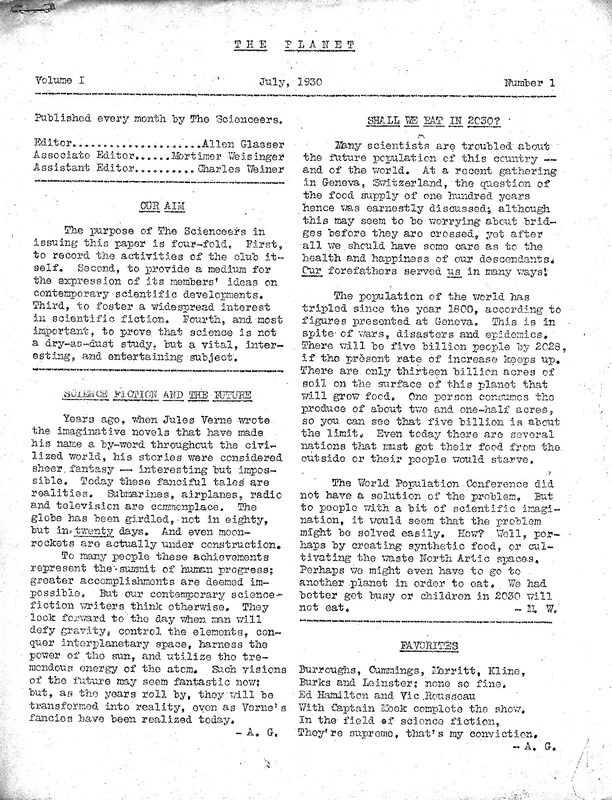 A squib on page 3 says the Scienceers published meeting notices every Friday in the New York Evening World, confirming Allan Glasser’s memory about the weekly meeting schedule. Unfortunately, I was denied the minor pleasure of locating one of those ads because the paper has only been digitized through 1922. MacDermott only claimed they met, not that they met on a regular schedule. Bill Higgins’ jibe, “Which is more fannish?” hits the nail on the head. This entry was posted in Clubs and tagged Allen Glasser, Aubrey MacDermott, Bill Higgins, Eastbay Science Correspondence Club, Fred Patten, Scienceers by Mike Glyer. Bookmark the permalink. Sadly, the EVENING WORLD is not scanned on the archival service I have access to. And the comment about Phil Rosenblatt on page 3 show the usual fannish love of puns. Shocking! Ned had also kindly scanned Robert Bloch’s “A Way of Life” for me. It strikes me that this should be shared more widely, but I don’t know whether the author has an estate, or whether it feels it can squeeze more blood out of the stone. The comment “the dead do not procreate” sounds pretty creepy. Robert: not half as creepy as its opposite would be. There are parallels between this debate (about the first SF club) and the ongoing 70+ year old controversy about which get-together was in fact the first science fiction convention. Did Edgar Allen Poe throw parties? Re “the dead do not procreate” — IIRC the context is that the gimmick involves racial memory passed down from ancestors to descendents, but the story goofs by including instances of memories “recalled” even from those who died without first getting around to having any descendents. I just took a closer look at my copy of THE PLANET v.1#1, three sheets of yellowing 8.5×11 paper – it is definitely an old xerox copy, as the printing is ON the paper, not IN the paper.